Perhaps it’s time to change the way students learn history. Eric Freedman, a professor in Sacred Heart University’s Department of Teacher Education, thinks so. Freedman recently published a paper in the journal Cognition and Instruction, specifically considering this challenge—essentially, what might history classes look like if we were to teach them through the skill of historical analysis? The paper won him the 2016 award for Exemplary Research in Social Studies from the National Council for the Social Studies. 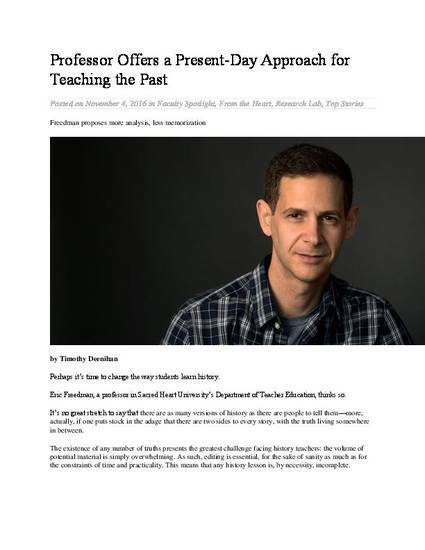 The article, “What Happened Needs to Be Told: Fostering Critical Historical Reasoning in the Classroom,” details Freedman’s study of a high school history class that had the opportunity to learn from different and differing primary sources recording the Vietnam War.